The beans are so abundant in Mexico, that there are many recipes with beans within the Mexican cuisine. Although none of these recipes is as famous nor as versatile as the refried beans. This dish has mashed beans (similar to the consistency of a puree), which are fried so they acquire more flavor . As a final touch they are garnished with crumbled cheese and tortilla chips; which makes them look magnificent – and its flavor is so good that you will want to eat them at every time of the day. The refried beans have infinite applications. They can be served plain as antojito or accompanying a wide variety of dishes like: chilaquiles , quesadillas , ranch style eggs , grilled steak , enchiladas , etc. They are also used as base in sopes, tostadas , burritos , gorditas, molletes, memelas, etc. In this recipe you will work with some ingredients, then the beans are fried and at the end they are garnished. Definitely an easy to make recipe. To prepare the refried beans cooked beans are needed. We recommend making the pot beans recipe previously and then use them in this recipe. The traditional recipe is prepared with lard however if you want it can be substituted for 2 tablespoons of oil (vegetable or olive). The refried beans are normally prepared with pinto, bayo or black beans. Heat in a saucepan over medium heat 3 tablespoons of lard. 2 cups of Whole Cooked Beans with a little Broth. Mash with a bean masher the saucepan ingredients, until having the consistency of a puree. Fry the beans for about 5 minutes, until they are moderately fried and thick; stir constantly. When the refried beans are served you can sprinkle over them some crumbled cotija cheese. You can also insert in the refried beans some tortilla chips. 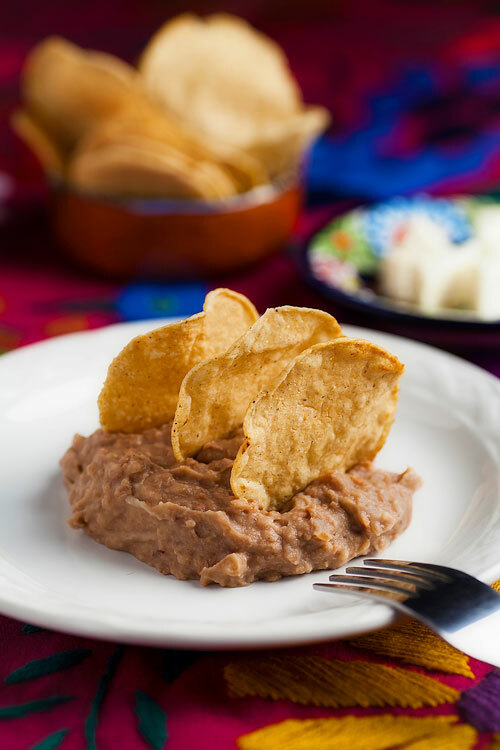 Tip: The refried beans can be frozen , without any problem and in this way you will always have them available. Suggestion: If you liked the consistency of these beans get ready for the cream of bean soup. Variation: Another way of preparing beans – charro beans. Did you like the Refried Beans? Mash the beans to perfection and get the exact consistency that you were looking for in your beans with the “Jamie Oliver Masher". This is the cotija cheese that you have to put to your beans, because it carries the authentic Mexican flavor. The “R. W. Garcia Tortilla Chips" apart from having a great maize flavor they are also natural, crispy, low-salt and no fat nor preservatives. Ideal to accompany your Mexican food.